Below is a list of my most frequently asked questions. I believe this will also provide more info in regards to my overall cartooning services. If you’re looking to commission or hire me, I’d refer you to the contact page, so you can fill out the form. I would just need your name, contact info and some details about your project. I shall email you back, most likely with a quote if I have enough detail and then we can get the ball rolling. What happens if I’m not happy with the artwork? My services include unlimited revisions. So I will endeavour to correct the artwork until you are 100% satisfied. If in the unlikely event we can’t get anywhere, then I will happily offer a full refund. This can depend on the client and/ or situation. If you’re trading as a limited liability company, I would accept a 50% down payment and then the rest upon completion of the artwork. If you’re an individual, I may ask for payment upfront. My services include unlimited revisions, ensuring you would be satisfied with the final outcome. Can I use the artwork on your website? Most of the artwork on my website is owned by my clients that are being displayed for portfolio purposes. So pretty much, none of the artwork can be used. However, I do have a page that contains free stock illustrations. These can be used for personal projects. If you wish to use them commercially, you would need to contact me to purchase a license. Can you mail me the original sketch? As stated above, I create all illustrations digitally. Therefore I can’t send original pencil artwork per se. I can send the digital sketch file if you wish to see it. Or if you really, really want an original pencil sketch on paper mailed out to you, I can re-create your illustration especially for a fee. What files do I receive at the end? By default, I will send a transparent .png by default, then any format can be requested after, such as the original source vector file. There are certain illustrations that can’t be created with vector. However, I will always advise prior to making an order. How long do I have to use my free revisions? The unlimited revisions can be used for as long as is necessary to complete your artwork until you’re fully satisfied. The unlimited revisions will cease once either the artwork has been approved or 2 weeks after no contact has been made. My preference for this is generally via email. Why? So I have everything logged down and ready to refer back to if/ when I start working on your commission. I’m more than happy to pick up the phone and speak with you. However, I will most likely ask for an email summary of our conversation so I can refer back. I’m also happy to meet in person. If you’re local to me, you’re more than welcome to visit me in my studio. How long will my commission take to complete? This depends on a number of factors. Namely, how busy my current schedule is, how big your project is and also potentially how urgent you need it. As an average, I’d say most small to medium sized projects are completed within 1-2 weeks. PayPal or bank transfer works for me. I would always recommend PayPal as it’s the safest option for both parties. Yep, I undertake commissions of any size. Need a professional to draw a fingernail?… I’ll happily oblige. Or oppositely, a cartoon version of the beautiful artwork on the Sistine Chapel ceiling… I’m your guy. Would I own the rights to the illustrations? Yes, all image rights are included with the quotes. Unless you’re ordering a personalized portrait. However, if you need to use a personalized portrait for commercial purposes, we can discuss image rights. Can I get sample sketches? Unfortunately I don’t do sample sketches or speculative work. My time has to be paid for. I would expect that if you like what you see on my portfolio and feel my style would be a good fit to your project, then you will happy with what I create. 97.9% of the time, no. However, if you have something of equal value to offer me in return, I may consider. It wouldn’t hurt to ask. However, ‘exposure’ isn’t something to be offered to me. Why don’t you show prices/ how much do you charge? I don’t show prices as each project is different to the next. There are too many variables involved to have set prices for things. There are certain services I offer set prices for, such as single character mascot design and individual personalized cartoon portraits. I get emails every so often asking “How much for a cartoon?”. The problem with that question is ‘cartoon’ is such a generic term. It’s like asking a builder “how much to build me a house?”. Well, how big is the house? How many rooms? How big a plot? etc. I need info about your needs to be able to give an accurate price. I get asked a lot if I do animation. The short and technical answer is no, I do not. However, understandably many get ‘animations’ and ‘illustrations’ mixed up. But they are both very different things. In general, animation represents artwork that moves, like the cartoons you see on TV and illustrations means still drawings. A vector file is a graphical file that has no boundaries in terms of resolution. It can be scaled up to unlimited sizes. This is noticeable when you zoom in and the quality is still clear. It doesn’t become pixelated. Vector graphics use mathematical commands to determine how the image is structured. Vectors can be opened and edited using certain software such as Adobe Illustrator. 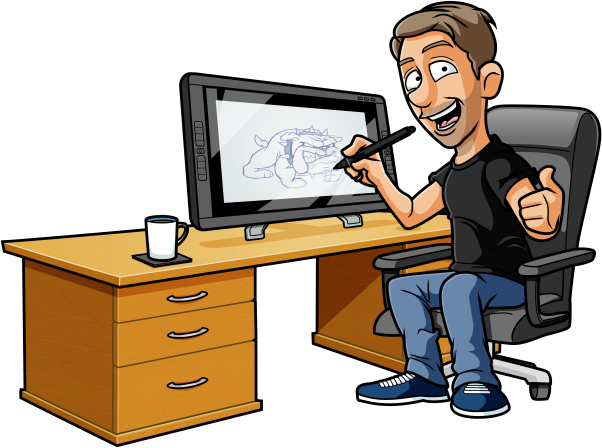 All my artwork is created digitally using a 22″ Wacom Cintiq Touch. I ceased using actual pencil and paper back in 2014. I usually sketch with Autodesk Sketchbook Pro and create line-art and coloring with both Adobe Illustrator and Adobe Photoshop. Have a question that’s not on the list? Please feel free to email me and I’ll get back to you at my earliest convenience.